For her deal to pass, May needs to get at least 75 MPs to change their minds after parliament twice rejected her Brexit deal. The Times reports that several ministers are not pleased by the management of the Brexit process and especially by her speech on March 19th, where she criticized MPs for not passing the deal. They are likely to propose changes, or amendments, to this motion setting out alternative ways forward on Brexit. But across the country you can see the anger. 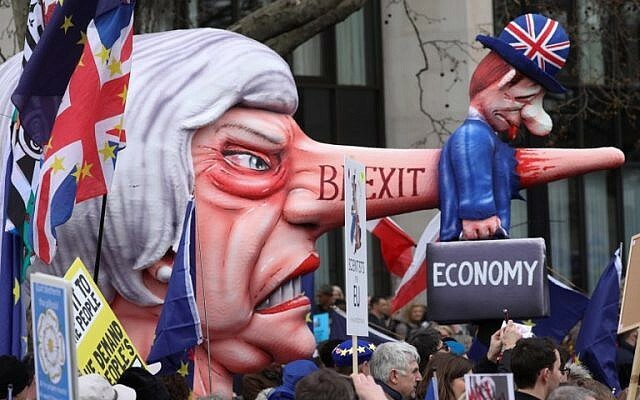 May had no plan B and that at one point she backed the country leaving without a deal, contrary to her repeated statements which warned about the economic consequences of a no-deal Brexit. The Cabinet Office minister spoke out ahead of crunch talks between the PM and hardline Brexiteers including Boris Johnson at Chequers this afternoon, as ministers plotted to topple her. May is immune from a leadership challenge until December under Conservative party rules, since she won the last challenge in December 2018. 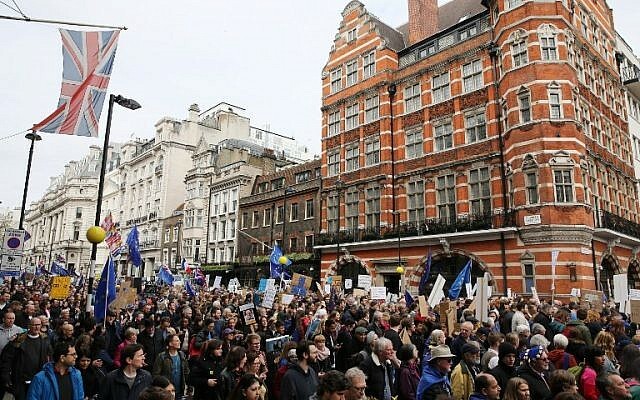 Hundreds of thousands of people opposed to the UK's withdrawal from the European Union marched through central London on Saturday to demand a new referendum as the deepening Brexit crisis risked sinking Prime Minister Theresa May's premiership. Gareth Rae, 59, who travelled from Bristol to attend the demonstration, told Reuters: "I would feel differently if this was a well managed process and the government was taking sensible decisions. We need a new PM who can reach out & build some sort of coalition for a Plan B", he tweeted. While some have expressed astonishment at the climbing number, others have been more skeptical, suspecting that bots and people using false details to claim British citizenship or residency could be involved. While the turnout today reflects public concern and anger over Brexit, it seems unlikely a Prime Minister cornered by her Brexit policy and under huge political pressure within her own party to deliver on Brexit will respond to their concerns. May had been planning to try once more this week, but she conceded on Friday in a letter to MPs that the chances of it being approved are so remote she may not even put it to a vote. The premier had sought a three-month extension from the European Union, but got only a two-week delay to April 12. "I have absolute admiration for the way she is going about it". However, she faces daunting odds with lawmakers deadlocked for months over how to implement the 2016 referendum vote to leave, reflecting bitter divisions nationwide. He said Mrs May is doing a "fantastic job" and that he has no desire to take her place.